Daniel Claiborne Hudson (born March 9, 1987) is an American professional baseball relief pitcher for the Toronto Blue Jays of Major League Baseball (MLB). 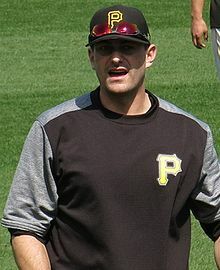 He previously played for the Chicago White Sox, Arizona Diamondbacks, Pittsburgh Pirates, and Los Angeles Dodgers. Hudson attended Princess Anne High School in Virginia Beach, Virginia, and Old Dominion University in Norfolk, Virginia, where he finished second all-time in strikeouts with 295 (Justin Verlander is first all-time), sixth in games started with 40 and seventh in innings pitched with 292. He posted a win–loss record of 20–14, and had a 3.79 earned run average. On December 21, 2016, Hudson signed a two-year, $11 million contract with the Pittsburgh Pirates. In the 2017 season, Hudson appeared in 71 games for the Pirates, compiling a 2-7 record and a 4.38 ERA. On February 22, 2018, the Pirates traded Hudson, Tristan Gray, and cash considerations to the Tampa Bay Rays for Corey Dickerson. However, the Rays released him on March 28. On April 2, 2018, Hudson signed a minor league contract with the Los Angeles Dodgers. He made the Dodgers major league roster and pitched in 40 games for them (with one start) and was 3–2 with a 4.11 ERA in 46 innings, before missing the last month of the season with an arm injury. On February 9, 2019, Hudson signed a minor league contract with the Los Angeles Angels. He was released on March 22, and signed a one-year contract with the Toronto Blue Jays on March 25. ^ "Chicago White Sox to call up Daniel Hudson to replace Jake Peavy in starting rotation". ESPN.com. Retrieved August 13, 2015. ^ "White Sox get Jackson amid speculation". Chicago White Sox. Retrieved August 13, 2015. ^ "Ben Nicholson-Smith on Twitter". Twitter. Retrieved August 13, 2015. ^ Berry, Adam (December 21, 2016). "Hudson's gritty path brings him to Steel City". MLB.com. Retrieved December 21, 2016. ^ "Pirates add Corey Dickerson to outfield in three-player trade with Rays". CBSSports.com. Retrieved February 18, 2018. ^ Todd, Jeff (March 28, 2018). "Rays Release Daniel Hudson". mlbtraderumors.com. Retrieved March 28, 2018. ^ Stephen, Eric (April 2, 2018). "Dodgers sign Daniel Hudson to minor-league deal". SB Nation. Retrieved April 2, 2018. ^ "2018 Los Angeles Dodgers statistics". Baseball Reference. Retrieved October 2, 2018. ^ Adams, Steve (February 8, 2019). 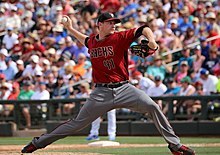 "Angels, Daniel Hudson Agree To Minor League Deal". MLB Trade Rumors. Retrieved February 9, 2019. ^ "Toronto Blue Jays on Twitter". Twitter. Retrieved March 25, 2019. ^ "Brooks Baseball · Home of the PitchFX Tool – Player Card: Daniel Hudson". Brooks Baseball. Retrieved June 20, 2012. ^ Mayo, Jonathan (December 31, 2009). "Hudson stormed way to Majors, MiLBY: Sox righty made way from Class A to U.S. Cellular Field". MLB Advanced Media, L.P. Retrieved June 17, 2011.